Ron Blue is the founder of Ronald Blue & Co., LLC. He is considered a successful entrepreneur in the financial services industry and an admired leader and speaker on the topic of Biblical financial management. Following his graduation from Indiana University with a Masters of Business Administration degree, Ron joined the management group of Peat, Marwick, Mitchell & Co. and worked with the firm in New York City, Dallas, and San Francisco. In 1970, Ron founded an Indianapolis-based CPA firm which has grown to be one of the 50 largest CPA firms in the United States. Convinced that Christians would better handle their personal finances if they were counseled objectively with the highest technical expertise and from a Biblical perspective, he founded Ronald Blue & Co., a fee-only financial planning firm, in 1979. 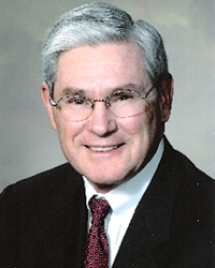 Ron retired from the financial planning firm in 2003 but currently serves as President of Kingdom Advisors. Ron is the author of twenty books on personal finance from a Biblical perspective, including the best-seller, Master Your Money and Surviving Financial Meltdown, co-authored with Jeremy White. Ron currently serves on the Board of Directors of Campus Crusade for Christ, Crown Financial Ministries, The National Christian Foundation and on the Board of Trustees of The Maclellan Foundation and The Sandra and William B. Johnson Foundation, Inc. He formerly served on the Board of Directors of Promise Keepers, Family Research Council, Insight for Living, Medical Institute for Sexual Health and Walk Thru the Bible Ministries. Ron Blue, founder of Ron Blue and Co. and president of Kingdom Advisors, served as Lake Distinguished Visitor on September 21 and 22, 2010. Speaking to audiences of financial advisors, academic administrators, Indiana University Foundation leadership and Philanthropic Studies students in both Indianapolis and Bloomington, Mr. Blue shared his personal perspective on the connections between faith and giving and outlined advice for maximizing generosity. Don’t spend more than you take in. Save what you don't spend. Develop a long-term financial plan. Why Don’t They Give More? Their personal financial situation is in chaos. They have no vision to inspire their living and giving. They have no relationship with a charitable organization. They don't plan to give because they think what they have is theirs, they earned it and it is for them. They give sporadically out of impulse rather than systematically out of passion.